No one really wants to talk about any of this. It means you have to confront your own mortality and think about life without your loved ones. You love your family so much that it is painful to dwell on death. But, it is because you love our family so much, that it is so important that you take the time to understand Oklahoma probate law and estate planning. And, that once you understand the process, that you search for and hire an excellent family attorney to help you through the planning process. Should I Hire a Family Attorney for My Probate and Estate Planning? 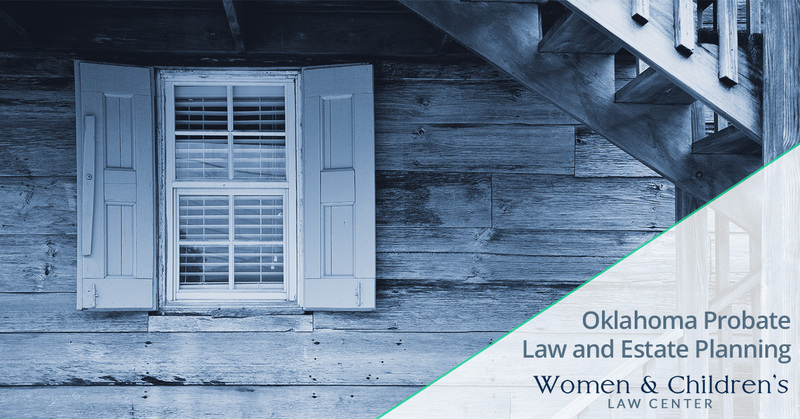 Yes — with one caveat: Make sure your family attorney has a comprehensive Oklahoma-based estate planning practice, like ours here at Women and Children’s Law Center. You want your attorney to help with planning now, to assist in creating and modifying medical powers of attorney, and to provide advice when it comes to dealing with probate and estate administration. You can hire an attorney who specializes in just estate planning, but they are less likely to be prepared to assist you with issues such as child custody and other family-related issues that should be part of your estate planning. That’s why we think it is best to work with a family attorney with a strong estate planning practice. Oklahoma has a probate process for handling property upon someone’s death. Most often, the district or county court where you live handles probate. If you have no will, it is up to the court to determine to whom your probate property – property that is owned only by you and not jointly with a spouse or partner – is distributed. There are fairly strict rules for the distribution of property when there is no will, including what previous spouses and children from previous marriages are entitled to from an estate. If you don’t have a will, you are running the risk that your property won’t be distributed according to your wishes. Don’t just assume that your spouse will receive your property. This often isn’t the case. What Happens if I Do Have a Will? If you have a will, the probate court will distribute your probate property according to your wishes. Your will overrides any individual’s claim on your estate with the exception of named beneficiaries. When you open a bank or investment account, including 401(k) accounts, you are asked to name a beneficiary. The same is true with life insurance policies. You can name one person or several people who you want to share the assets in an account, or receive life insurance payments, in the case of your death. Named beneficiaries take precedent over anything stated in your will, so it is important to keep those documents up to date. If you have not named a beneficiary, and no one else is named as an owner on bank and investment accounts, those assets will be distributed according to Oklahoma probate law. What if My Assets are Owned Jointly? If you and your spouse or partner own your home together, as long as he or she survives you, your home will not be considered probate property and will pass directly to them. The same goes for bank accounts and investment accounts. If they are jointly owned, and the co-owner survives you, they are not subject to the probate court’s discretion. This is a difficult question to answer. If you have a complicated estate, or want someone other than the probate court to manage the distribution of your assets, then you may want to put your assets into a trust. There also may be some tax advantages, which you should discuss with your tax accountant. If you’ve named an executor, that person is responsible for the dissolution of your assets. They have a fiduciary responsibility to fulfill their role according to your wishes. And, while they aren’t required by Oklahoma law to hire an attorney, it is a very good idea for them to do so. They’ll be dealing with complex tax laws, transfers of titles and other asset transfers, and it is easy to make mistakes. An attorney can help an executor by explaining their legal obligations to them, helping them locate reputable experts to help determine the total value of an estate, preparing and filing legal paperwork, and making sure tax forms are filed properly and on time. We hope this gives you a better understanding of why estate planning is so important for Oklahoma residents. We’d be happy to sit down for a consultation and discuss your situation with you. Just give us a call to schedule a time to come in and meet with us.